I had DJ Mav DJ my wedding in June, 2011 at Studio 450 in Midtown Manhattan and he was stellar to say the least… the venue was a 2 floor place, he had 2 set-up’s, the first upstairs for the ceremony and cocktail hour and the other downstairs for the reception – Everything went smoothly in every facet of the night, including the transition from upstairs to downstairs. He was given a long list of music requests varying from the Rolling Stones to modern day Indy music and all was played and as requested (certain songs for the cocktail hour, certain ones for the dance portion of the night). He really got the party going during the reception by adding in some of his choice selections that were geared toward the crowd. All announcements were made and he took all my requests – I think I had half the party tell me how great the DJ was. Overall, we couldn’t have asked for more out of a DJ, I would recommend him for any event. DJ Mav Entertainment made our wedding so special. All night long the dance floor was filled and that included me too (the bride)! He listened to my requests of songs and played them all and knew the best times to play them too. My aunt even came up to us after the wedding for his information so he could dj an event for her. He was also so great to work with and we consider him a friend. Anyone who books DJ Mav will be so happy with their choice & will have a fantastic party. Great Wedding DJ! The choice of a DJ was one of the things we agonized most over while planning our wedding–after all, one depends on that person to set the mood for several portions of the big day. With that being said, we couldn’t have been happier with our choice of DJ Mav. The pre-event planning consists of a comprehensive worksheet where you fill out all the genres/songs that you’d like to be played. Once Mav reviewed ours, he didn’t hesitate to call if he had any questions, which was great to calm my nerves. In person, Mav is friendly, professional and well-dressed (no piano-key neckties here!). He seamlessly transitioned our evening from mellow to all-out fun, while incorporating our requests, (both pre-planned and on the fly). I’m not sure how he did it, but he melded together my parents’ 70s music, bluegrass, hip-hop, and my personal request for old-school Michael Jackson. I would definitely recommend him to anyone planning a wedding! Excellent Wedding DJ! DJ Mav was the best wedding DJ that we could have hoped to find! He was thoughtful, polite, engaging, and was so responsive to our specific requests. He remained visible and engaged the dance floor without drawing attention away from the party atmosphere. DJ Mav picked music that moved easily form one part of the evening to the next, and he kept everyone dancing! Music was a HUGE part of our evening, and DJ Mav created a seamless production. He is professional and courteous, and also knows how to keep everyone enjoying the event. Anyone who books him will be very happy with the experience of working with him throughout the process. 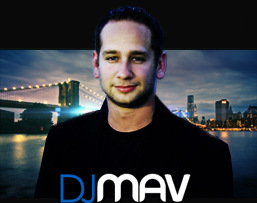 With an enormous list of DJs to choose from, we made the right choice with DJ Mav. He was very polite and professional, and played the “right” songs from our suggestion list (filled with tunes from the 70s contributed by our parents). Furthermore, he kept the party going, and everyone had a great time. The booking process was hassle-free (and eco-friendly). I would definitely recommend this vendor! All I wanted to do for my 30th birthday is have a good time with family and friends. DJ Mav made that happen…great music, great mixing, and managed to keep the dance floor packed for 5 hours. I couldn’t have asked for a better DJ! His punctuality and professionalism just added to the reasons why I would hire him for every one of my parties going forward. In addition, The management at 42 @ The Ritz Carlton was so impressed they made DJ Mav a Saturday night regular. On October 9, 2011, we had our Daughters Sweet 16 at the Orient Lounge in Poughkeepsie, NY. DJ Mav was our DJ for the night, and what an awesome night it was. Mav played for 4 hours straight, the tunes that everyone wanted to hear. No one sat! The dance floor was filled the whole night. Thank you DJ Mav for a memorable party that my daughter will cherish for rest of her life!